This article submitted by Linda Stelling on 5/12/99. The Paynesville Fire Department was called to a trailer house fire on Tuesday, May 4, which claimed the life of Harlan Hobert, 76, Paynesville. Hobert lived seven miles south of Paynesville on 380th Street, just off Highway 4. The fire call came into the fire department at about 11:45 a.m., after a motorist on Highway 4 called it into Meeker County. 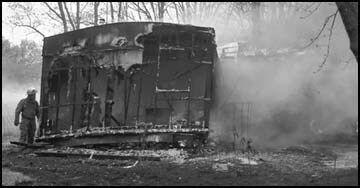 Strong southeast winds sent the blaze through the trailer and an addition built onto the trailer quickly. A Ford van parked beside the trailer was also destroyed by the fire. The Paynesville Fire Department had one crew assigned to stopping other fires started as a result of the wind blowing sparks into the yard and across the road into a wetland. The firemen were concerned about the consequences if the large wetland area would catch fire. According to the Meeker County Sheriff's Department, cause of the blaze is unknown. Once the fire was under control, the firemen found a body of an elderly man in the bedroom. Autopsy reports done by the Anoka Medical Examiner identified the body to be that of Harlan "Ted" Hobert, 76, Paynesville. He died of smoke inhalation. Complicating the fire fighting were two dogs at the scene owned by Hobert. One dog was rather aggressive and bit some of the firemen and a Meeker County Deputy before they were removed to an animal shelter. The cause of the fire is under investigation by the State Fire Marshal and Meeker County Sheriff's Department. Funeral services for Hobert were Saturday, May 8, at Dingmann's Funeral Home, Eden Valley. Interment was in the Trinity Lutheran Cemetery, Balaton. Besides the trailer house fire, the Paynesville Volunteer Fire Department responded to three other calls last week. On May 1 at noon, the firemen responded to a call of a grass fire on the Ben Holthaus farm in Roseville Township. The firemen were there about one hour. On May 2 at 7:30 p.m., a car fire was reported in Munson Township by Roscoe. A vehicle being driven by Tom Tengwall, New London, was destroyed. Cause of the fire is unknown. On May 5 at 11:15 a.m., the fire department received a false alarm from Stearns Manufacturing in Paynesville.